Since spring is such a nice and eventful time of the year, Yeouido Park in Seoul has a week long flower festival that takes place in mid April. One can go to the park and walk around enjoying the blossom of about 2700 trees. 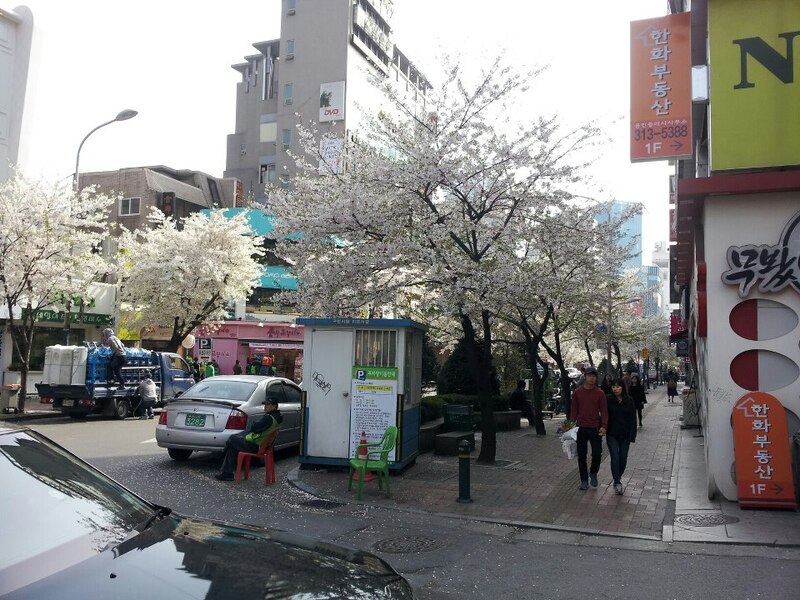 The best part is that there is more to it than just beautiful blossoms: since it’s an actual festival, there are street vendors everywhere and it’s easy to get a refreshing ice cream or extremely delicious street food, there are also performers and shows, as well as the light show during the night, and there are bike, scooter, and rollerblade rentals. The park itself is super beautiful and it’s relaxing to walk around. Two of my friends and I spent an amazing afternoon simply walking through the park and sitting close to the river relaxing and soaking in the sun. 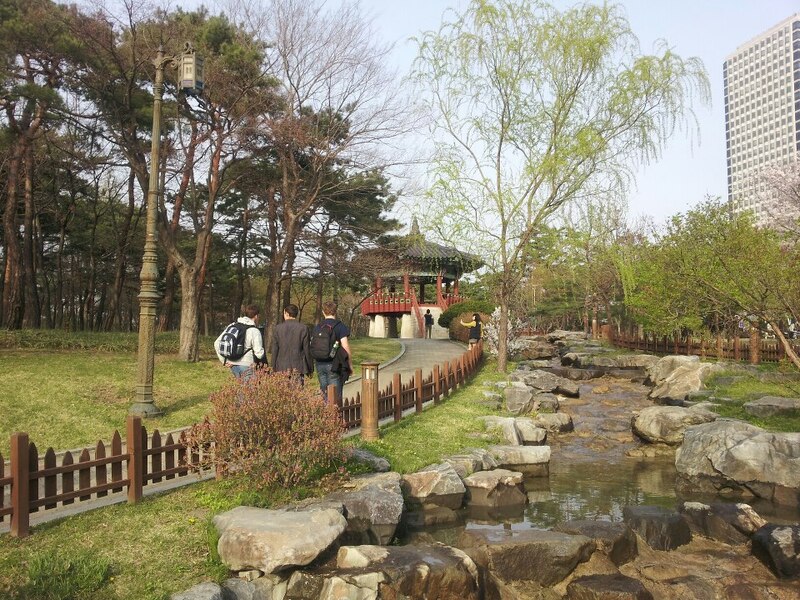 Yeouido Park is also a great place to simply learn more about Korean culture, especially couple culture. It is really fascinating how many couples there are in Korea. Everyone is obsessed with being in a relationship, and that is very obvious in Yeouido Park as there are so many couples enjoying the walk down the alley full of blossomed trees, riding the tandem bikes, sitting at the Han River bank, or simply enjoying the sun and nice weather. 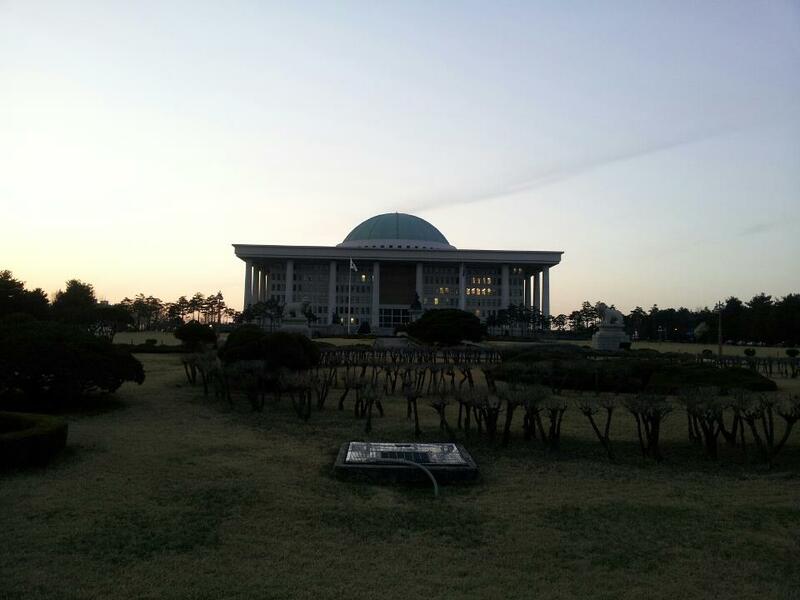 Since the National Assembly is quite close by, it’s easy to walk over and enjoy the sight of it, too. It is really sad how less and less time I have for enjoying the springtime now that midterms are just around the corner. Next week is the midterm class and I have to write two big papers for my International Conflicts and Cooperation and Free Trade Agreements classes. Apart from that I will have an in-class exam for my US-Korean Relations class. To be honest, I am quite anxious to see how it will all go. I understand that the standards and educational system here are very much different from everything I have experienced up to this date (Bosnia, IB, Richmond, and Sweden) so I am not quite so sure what to expect. Every time I ask a Koreans, or other exchange students, who have been at Yonsei for a while about the examinations here they all tell me that a lot of it is based on memorization. That is very much on the opposite side of the educational spectrum since at UR and at Uppsala University one is more pushed to use the information one gets from the class and integrate it into real world issues thereby using a bit of memorization in a combination with logic, reasoning, and problem solving. I can’t say that I have experienced the issue of mere memorization here yet, as the assignments and papers I have had so far have very much been on the level of the assignments I have had at Richmond. The in-class midterm will therefore be the most challenging, I would guess, but I will have to wait and see how it goes. This entry was posted on Monday, April 29th, 2013 at 5:23 pm and is filed under Indira in South Korea, Spring 2013. You can follow any responses to this entry through the RSS 2.0 feed. You can leave a response, or trackback from your own site.